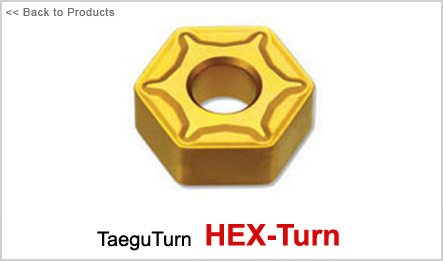 TaeguTec’s unique new HEX-TURN turning inserts offer exceptional performance and cost saving benefits. The 12 cutting edges of this hexagonal negative geometry insert will provide dramatically reduced production costs. Each corner of the insert contains a wiper geometry that enhances the quality of the machined surface even on high feed applications. Very economical solution with 12 cutting edges. Wiper geometry provides exceptional productivity and high quality surface finish. 120 degree included angle provides a strong insert design and excellent resistance against notching.